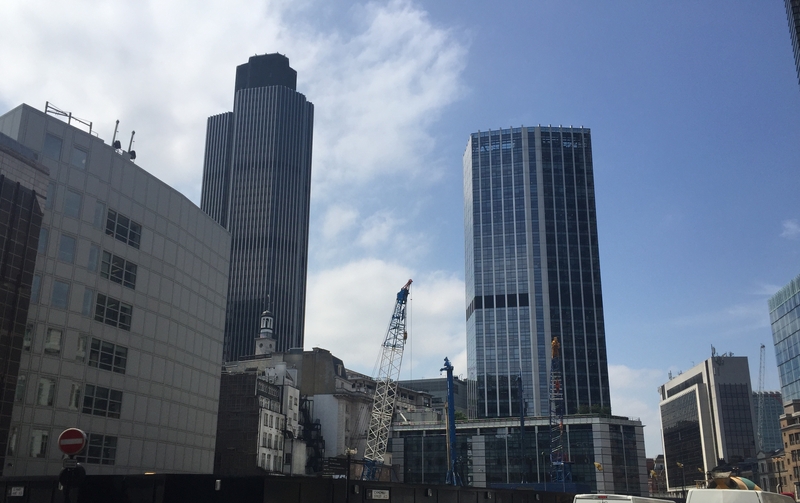 Metropolis research identified over 17m sq ft of UK office demand in the first half of 2015. Just over 9.2m sq ft of this demand was for office space in Greater London, with over 450 companies searching for London space. In the rest of the UK Metropolis uncovered 400 requirements for new space representing 8.1m sq ft of office demand. 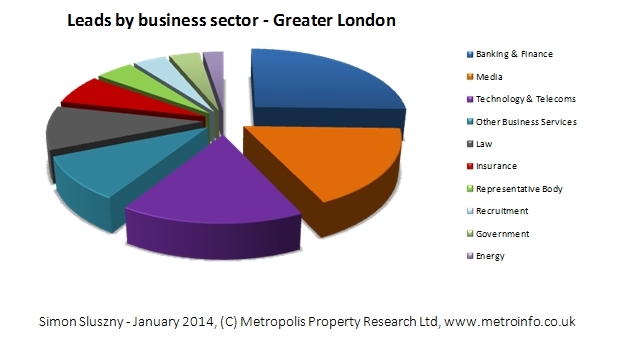 Central London office demand reached 8m sq ft, 3.8m sq ft (47.5%) of which was focused on the City of London. EC2 was the most popular postcode for companies planning a move, with 1.4m sq ft of demand emerging in H1. A significant proportion of total City of London demand (11%) came from two new law firm requirements, each firm looking for 200,000 sq ft. A new 150,000 sq ft requirement from an insurance group was also worthy of note. Demand from the banking and finance sector reached 1m sq ft, 26% of total City of London demand. Demand for space in the West End, where rents can reach £125 psf, hit 1.8m sq ft. The largest West End requirement (150,000 sq ft) came from a social media group looking for offices in SW1. Just over 400,000 sq ft of office space (26% of total demand) was required by the banking & finance sector, 79% of which (315,000 sq ft) came from hedge funds and private investment firms. 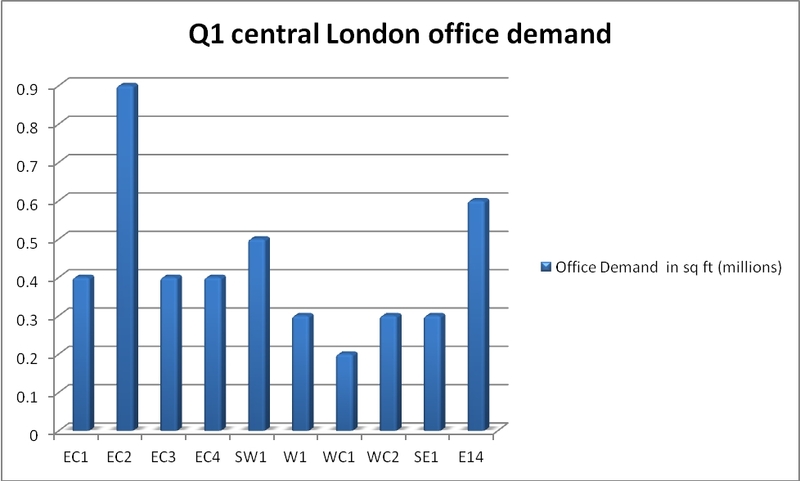 Mid Town office demand reached 0.9m sq ft, pretty evenly split between WC1 and WC2. About 100,000 sq ft of Mid Town demand came from the technology sector and 90,000 sq ft from the media sector. Demand from law firms was just over 120,000 sq ft and demand from the banking and finance sector totalled 110,000 sq ft. The largest office requirement in the South Bank (SE1) was a 140,000 sq ft search by an engineering and construction firm. Other requirements of note include a US insurance firm switching a 60,000 sq ft search from Maidenhead to London SE1, and a TV Broadcaster looking for 30,000 sq ft to house its news department. Two big requirements dominated demand for office space in the Docklands: a German investment bank back office requirement for 350,000 sq ft and an information company requirement for 300,000 sq ft, with a sub-let mooted. Manchester – The largest requirement, 400,000 sq ft, was a search by a government department considering space near Piccadilly Station in Manchester. Just over 250,000 sq ft of Manchester office demand came from the legal sector and 300,000 sq ft of demand was attributed to the insurance sector. Edinburgh – Similar to the picture in Manchester, Edinburgh demand was dominated by a large government requirement for office space (300,000 sq ft), although this requirement could move to Glasgow. In terms of private sector demand, notable requirements included a 100,000 sq ft search by a US Bank and two significant searches from law firms seeking a move in central Edinburgh, one for 50,000 sq ft and the other 30,000 sq ft. There was also significant demand from the accountancy sector, with four firms searching for just over 130,000 sq ft.
Birmingham – A retail bank was linked with the largest office requirement in Birmingham: 170,000 sq ft, a search now satisfied by space at Miller Developments Arena Central scheme. Other significant requirements include a potential 100,000 sq ft search from a law firm and a 50,000 sq ft search from a business education group. Reading – The largest requirement for Reading offices came from a network broadcaster looking for 150,000 sq ft, closely followed by a utility company searching for 140,000 sq ft. Both requirements also consider other Thames valley locations such as Bracknell, Farnborough and Slough. Bristol – Bristol office demand was dominated by insurance company requirements, with the sector accounting for 56% of total demand (280,000 sq ft). Other notable requirements include an 80,000 sq ft search from a Bristol based law firm planning to combine two of its offices (which may now be a refurbishment and extension of the existing building) and an engineering group searching for 25,000 sq ft. The Metropolis team researched over 455 UK company office requirements in Q1 2015, representing 9.6m sq ft of office demand. 5.5m sq ft of this demand was for space in Greater London, 4.3m sq ft of which was demand for central London space. 4.1m sq ft of demand was identified by our team in the rest of the UK. Demand for City of London space continued to be strong during Q1, with 2.1m sq ft required in over 91 planned office relocations. Four of the top five requirements by size were searches by banks with the other a significant requirement from a major accountancy firm. The top five requirements were moves planned in 2016, 2017 and 2018. 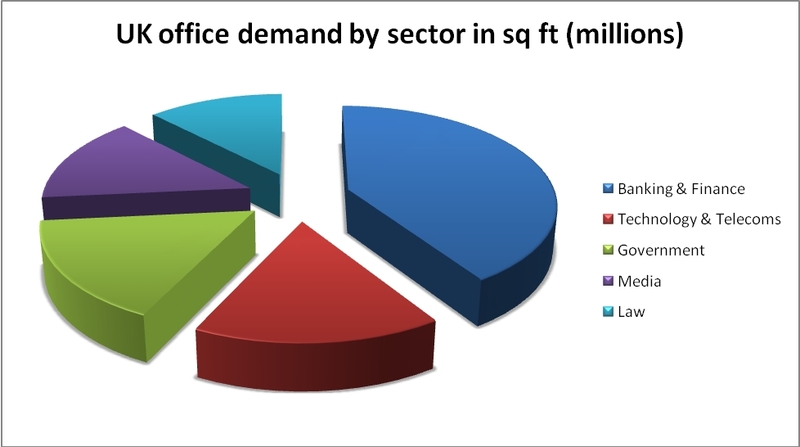 EC2 demand made up 42% of the total central London space required. 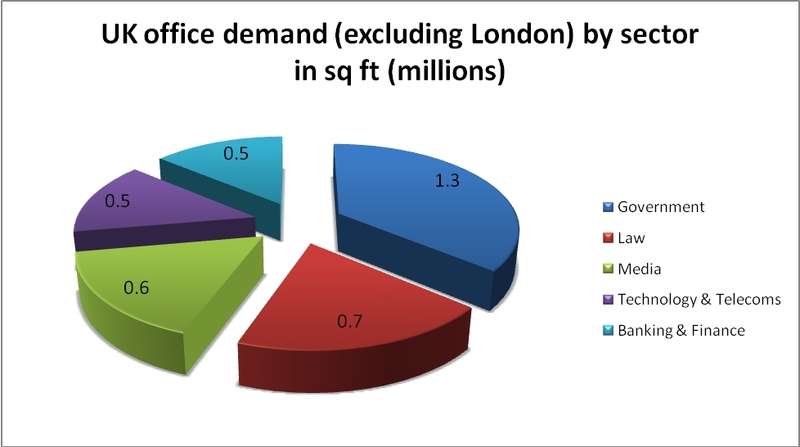 0.8m sq ft of demand was identified in the West End of London, 0.5m sq ft in London SW1 and 0.3m sq ft in London W1. Two of the top five requirements by size were searches by banking and finance companies. All of the top five largest moves are planned for late 2015 and 2016. 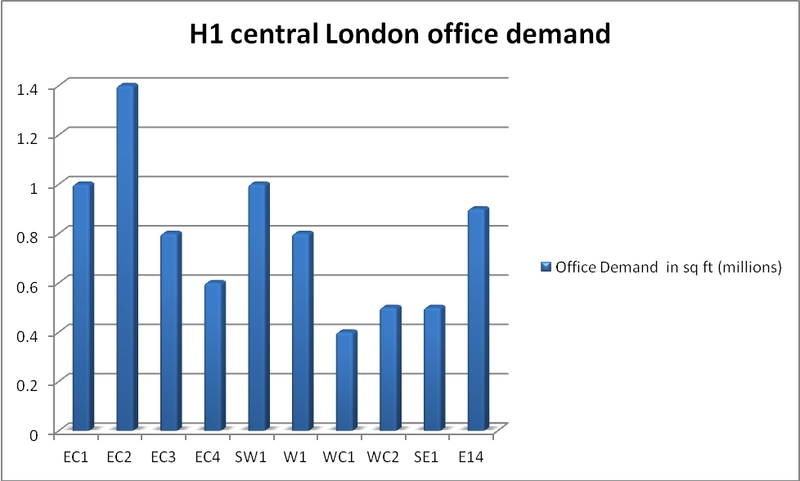 Mid Town office demand was mainly focused on London WC2, with two of the largest requirements centered on this postcode. One of the most significant requirements identified was an 80,000 sq ft HQ search by a TMT company planning a move in 2017. In London SE1, where 0.3m sq ft of demand was researched, the largest requirement came from a construction group. In E14, a 400,000 sq ft requirement from an investment bank made up 66% of the 0.6m sq ft of total demand for offices in the area. Banking & Finance sector UK office demand reached 2m sq ft in Q1 2015. The largest searches centered on the City of London and Docklands, although there was a notable search for 175,000 sq ft of space in central Birmingham. 0.8m sq ft of demand was identified from the Technology & Telecoms sector, and similar to banking and finance was largely focused on the City of London. There were however also significant searches for space in Manchester and Newcastle-upon-Tyne. The largest government requirements were for space outside of central London, the most significant a search for over 400,000 sq ft in Manchester. The largest media sector requirements centered on fringe central London locations and the top three law sector requirements were for space in Birmingham, Manchester and Bristol. Metropolis is currently tracking over 700 unique searches for space in London and over 400 in the rest of the UK. 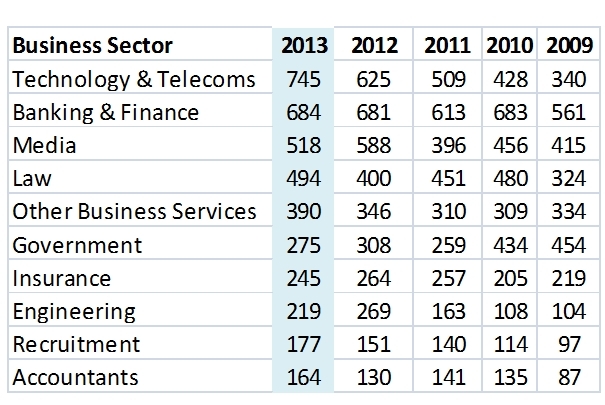 Banking and finance leads dominate the London business sector top ten for the fifth year running. The largest office requirements emerging from this sector are focused on the London EC2 postcode area. Similar to the UK picture, Technology, Media and Telecoms (TMT) sectors make up a sizable portion of the top ten in London (33.5%). The largest relocation and refurbishment projects in this sector are focused on London N1 and SE1. Law and Insurance sector leads saw an increase on 2012 numbers. Unsurprisingly law sector relocation activity centers on London EC4 postcodes, although there was also significant demand for new space in London EC2. Insurance sector office demand centered on London EC3, with close to 700,000 sq ft of space required in this postcode last year. London office deals reached 12.2m sq ft in 2013, up 37% on 2012’s result. According to our research, over 450 requirements for new space in London were active in the last six months and over 1,300 occupier lease expiries are due in the next two years. We expect to see office demand in London grow further this year, buoyed by improving economic conditions. There is currently close to 7m sq ft of office space under construction in central London expected to be delivered before the end of 2014. The Metropolis research team produced a total of 6,537 relocation, construction and refurbishment leads in 2013. Over 26% of these were active UK office space requirements, in line with 2012 research results. 1,745 office requirements were confirmed in total, with 1,056 new office requirements uncovered by our research, up 6% on 2012’s total and 19% on 2011’s.New requirements accounted for over 22m sq ft of UK office demand. 61% of Metropolis leads were projects located in the South of the UK (63% in 2012, 61% in 2011, 2010 and 62% in 2009), with 39% of lead projects located in Wales, the Midlands, North, Scotland and Northern Ireland. Greater London projects represented 45% of the 2013 lead total, a close match to the 2012 proportion (46%). Leads in Scotland saw a 120% increase when compared to 2012’s lead total, boosted in part by energy sector requirements in Aberdeen and an upturn in the Glasgow office market. West Midlands lead numbers saw an increase for the second year running, with several new Birmingham office requirements emerging from the law and insurance sectors. Results for other Northern regions were broadly in line with expectations, with North West lead numbers slightly down on last year’s result but still up on 2011, 2010 and 2009’s totals. 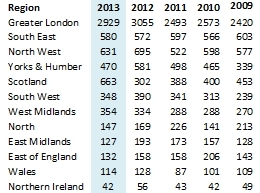 London and South East lead numbers were very similar to 2012’s totals. 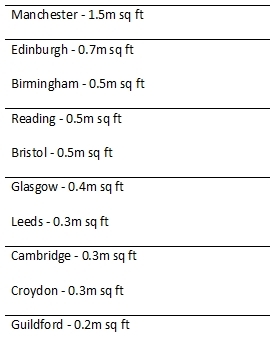 In terms of Greater London office requirements, the top 5 most sought after postcodes areas by demand were: EC2 (3.6m sq ft), W1 (3.2m sq ft), EC4 (3m sq ft), SE1 (2.7m sq ft) and EC3 (2m sq ft). 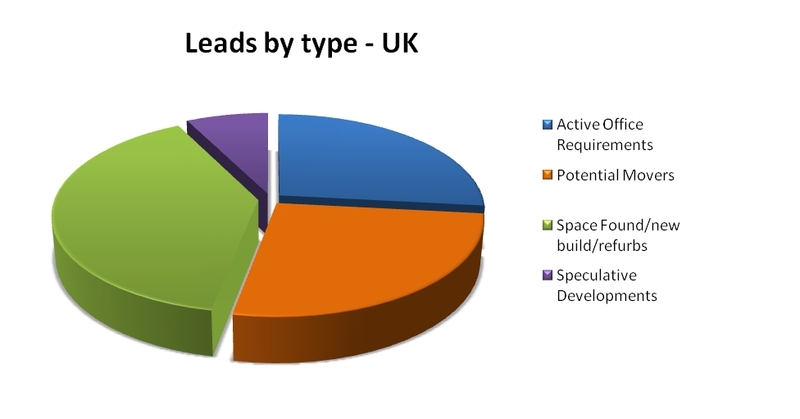 UK LEADS BY PROJECT SIZE – 53% of Metropolis leads in 2013 reported on projects over 10,000 sq ft. 46% of leads were made up of projects between 5,000 sq ft and 30,000 sq ft. 73% of leads covered projects over 5,000 sq ft. The increase in lead projects between 2,000 sq ft and 4,999 sq ft can be attributed to the number of SME’s facing 2013 and 2014 lease ends and those launching searches for additional and larger space as market conditions improve. TOP TEN BUSINESS SECTORS – The Technology & Telecoms sector overtook Banking & Finance in 2013 as the strongest UK business sector in terms of relocation and refurbishment projects. 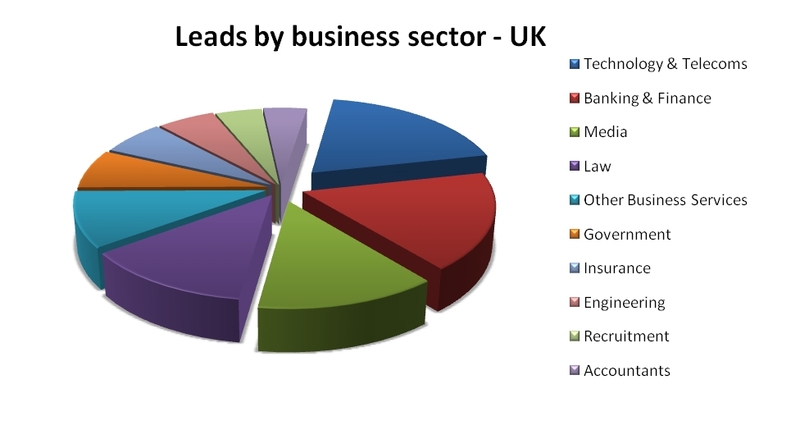 Lead numbers within this sector have grown year on year since 2009, making up 11% of all leads researched last year. If coupled with the Media sector under the popular designation of ‘TMT’, these two sectors were responsible for 32% of the top ten. The largest new technology office requirements were centered on London and the Thames Valley, with a few notable new searches emerging in Cambridge and Edinburgh. The Banking & Finance sector was pushed into second place last year, but still had a strong showing, on par with 2012 lead levels. Relocation and refurbishment leads on hedge funds and investment firms made up 33% of the sector total. Law firm leads saw a 23.5% increase when compared to 2012 lead numbers and we expect increased activity in this sector during 2014. The recently published Metropolis Law Report confirms we are tracking 140 active law firm office requirements totaling 2.6m sq ft plus over 100 law firms with lease expiries or breaks coming up between 2014 and 2016.